BRAMBLES suffering from dehydration, malnutrition and frostbite caused by exposure to cold wet grass, a wet burrow, cold winds and freezing temperatures. 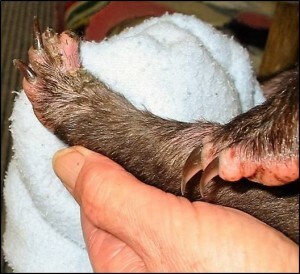 During the cold winter months “at foot” orphaned joeys can develop frostbite. These little wombats can survive for up to two or three weeks on their own. By the time they are found they are usually suffering malnutrition, dehydration as well as infected paws, legs, noses and muzzles. 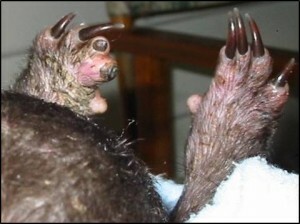 The photos above show the extent of the infection on this little wombat (scabs showing through the fur). 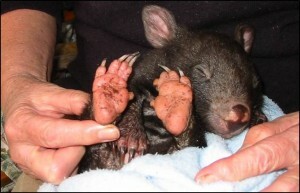 Wombat claws are like human fingernails they are constantly growing. Fortunately for Brambles the nail bed wasn’t damaged and after many months his claws grew back. 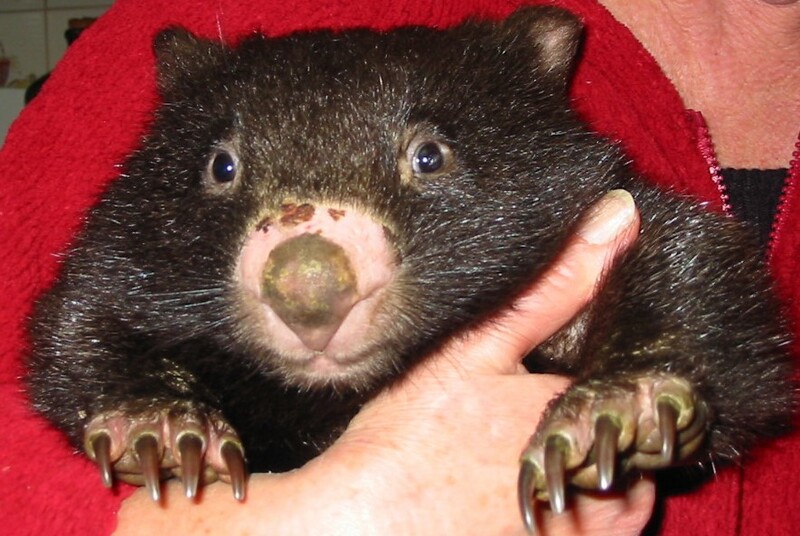 (A wombats claws are very important to it’s survival as they are needed to dig burrows and forage for food). Sometimes an antibiotic is needed to clear up infection. If you are in doubt seek advice from an experienced carer. These young joeys are usually dehydrated, so start by offering electrolytes. When Brambles was orphaned he stayed with his dead mothers decomposing body for nearly 2 weeks before he was found. He survived under the seclusion of a thick blackberry bush where his mother had managed to drag herself after she had been hit by a car. He stayed alive by nibbling on grass and remaining in this sheltered place. He eventually strayed looking for food and was found by a lady walking her dog. 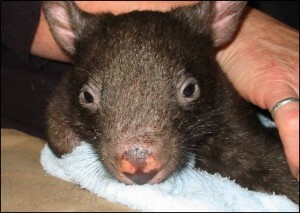 This little wombat was suffering from dehydration, malnutrition and frostbite from exposure to the cold elements. Brambles was in a very weak state and needed immediate attention. Fluids to rehydrate, warmth and security of a snug pouch, a course of antibiotics to clear up infection around his nose, feet and legs, along with lots of TLC to which he readily responded. Orphans like Brambles show how tough and resilient they are by managing to survive on their own. Their natural wild instincts are evident even at this young age and they usually do well once they have recovered from the initial trauma and go on to a full recovery and eventual release.